Photographer’s notes: Did you know that Google driverless cars ares struggling with fixie riders? The software that scopes the road is designed to identify cyclists and know when they are resting and when in motion. But fixed gear riders who can track stand their bikes, remaining nearly motionless on the road, have all the characteristics of a moving cyclist in their position on the bike. As they rock back and forth, Google cars are caught in a stop-go scenario. It has the developers both frustrated and amused as they can become trapped at intersections as fixie riders inadvertently create chaos. 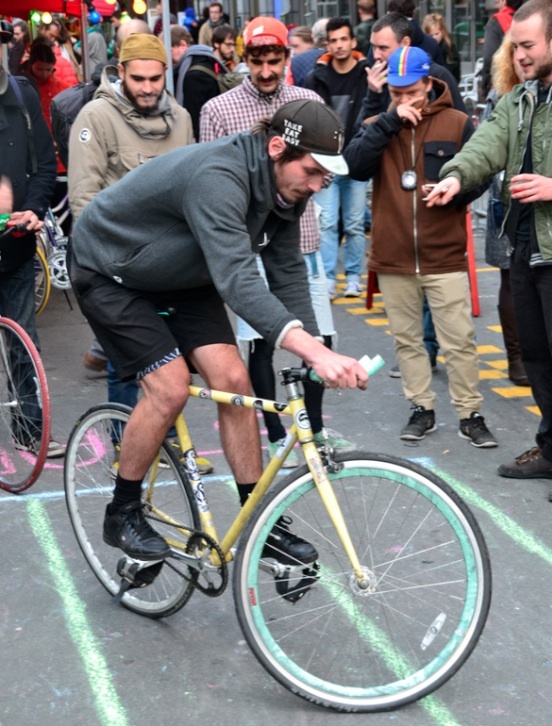 This entry was posted in bike messenger, Europe, event, family, fixie and tagged 2015, Belgium, Brussels, October. Bookmark the permalink.